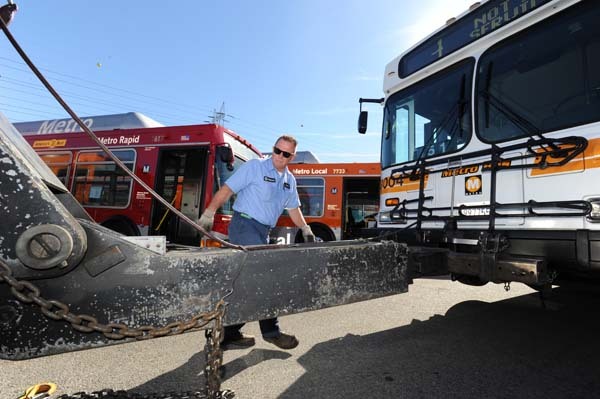 Here’s the official photo of the last diesel bus in Metro Los Angeles’ fleet being towed into retirement this morning. As we posted earlier in more detail, Metro is now the first major transit agency in the world that has a fleet comprised entirely of clean-burning buses. That includes 2,221 buses that run on compressed natural gas, six gas-electric hybrids and one bus that is fully electric. And what happens to the above bus? It’s being scrapped and holes are being punctured in its engine block so that it will never again run or burp out those very unlovely diesel fumes. Can I buy it and use it as a tool shed, like they used to do with the old streetcars? I highly doubt this particular bus has seen its final day. This particular bus is a fairly new 1998 New Flyer D40LF and is very popular transit bus all across North America. Metro can get a pretty good price for it at an auction. Nice idea, haha! That’d be so rad to build a shop out of old buses. But seriously, can’t they donate them to somewhere that has even more outdated buses? Probably too expensive, but just a thought. Bus #3004 retired in December actually. These buses retired in December. Venice Bus Yard (Division 6) had 3000-3002, 3004-3011, 3013-3015 and Veolia Transprtation Yard (Chinatown Yard, contractor) had Buses #3016-3019. The buses tha were at Venice Bus Yard were retired in December and the lines they run were on Lines 2, 302, 4, 304, 20, 28, 33,333 and 534. They did run on lines 30 and 31 and 330 until summer of last year after line 31 got cut. #3003 and 3012 were Training Buses in their last days. Buses #3016-3019 were the last units in service and retired recently. They ran on lines 96, 167 and 603. They were the last buses in service. When these buses took delivery back in 1998 they were orginally started their lifes at Division 5 (Arthur Winston, Mid-Cities Yard) and ran on lines 107, 108, 110, 204, 206 etc. As well these buses were ogrinally ordered by Citizens Area Transit (Now Regional Transportation Commission of Southern Nevada) From Las Vegas, NV but they rejected the 20 New Flyer D-40LF order so LACMTA end up buying these from New Flyer. I hope we atleast scrap it and recycle the metal… maybe even gut-out the motor and use it as art somewhere, or make it part of a playground! What better way to train our future patrons that transit isn’t as bad as most make it out to be! 3004 May have retired in December from service but was in storage until this morning. Also another thing to add, the 4500/4600 Series Neoplan CNG Buses (High Floor) are all retired and the 4700 series are being retired, they are a few left only. Why are we so into destroying the engine of old cars? The vehicle could be sold to a smaller agency who really needs a good deal on buses. There are agencies who probably have buses older than this one, and it would be a net benefit if they put this bus into service and retired their old ones. Metro shows a total fleet of 2,635 of which 129 are diesel and 173 are leased and are probably diesel. That is an old page on our website and the numbers are now incorrect. The current number of buses in the fleet owned by Metro is 2,228. Thanks for the heads up on the page! I spotted 3016 yesterday on Line 96 in downtown L.A. The retirement isn’t affecting the contractors. Andres, the bus is still in operable condition. It brings in money at the auctions Metro holds for equipment. The buses are usually bought by private carriers, such as Transit Systems, or they may find their way to Mexico. The ones at the contractors are in service still guys. It was spotted by some users. Only 3016-3019 remain in service but are one of those operated by contractors which is Veolia Transportation.